Deck Ledger Attachment with DeckLok - THE Deck Bracket System for Attaching Decks To Ledgers - Stay Connected With A Lateral AnchorDeckLok Deck Bracket System by Screw Products, Inc.
DeckLok® is a patented product that provides a bolt-on connection between your house and your sun deck. It stops catastrophic failure of decks by attaching directly to the house's floor joist! Available in post-manufactured, hot-dip galvanized and 316 stainless steel, DeckLok helps you exceed IRC and IBC 2006, 2009 and 2012 code requirements. Note: The International Residential Code (IRC) now requires the connection to the structure to be designed for both vertical and lateral load. DeckLok does this! Current building code requires decks to be bolted to the band or rim board of the house. However, the band board was never designed to support another structure such as a deck or sunroom! It may only be end-nailed to the floor joists. Movement (walking, dancing) on the deck causes the nails to pull out, precipitating collapse of the deck.The DeckLok Advanced Lateral Anchor System is designed to keep this mode of failure from occurring. 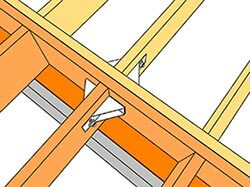 The lateral anchors are used in tandem, sandwiching the end of the floor joists while bolts secure the deck ledger board (through the band board) to the floor joists. This provides a bolted attachment in a cost effective, easy to install fashion.